Scouting reports on Guerrero often start and end with his main calling card, and it seems like one of the only things any reasonable sources can agree on. Power is the name of his game, after posting a .270 ISO in his age 23-25 seasons in Cuba. (for reference, Yoenis Cesepedes posted a .295 in the same age-span in the same league – all stats thanks to the wonderful Obstructed View) The same page includes a scouting report in which Guerrero is called ‘rigid’ in the field, and other reports have questioned his range and instincts as well. 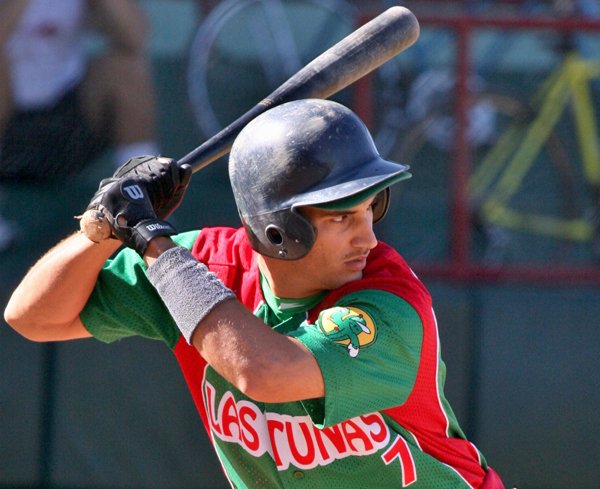 Scouts are not too high on his hit-tool, but historically scouts have given low-grades to the aggressive types of hitters that dominate the Serie Nacional. Thus far, given the success that both Cesepedes and Puig have seen against good pitching, it seems that we may have to take such criticisms with a grain of salt. Guerrero posted a .387 OBP in his professional career in Cuba, and his ISO comes in at a healthy .225 that is even a bit misleading considering the lowest mark he has posted at the highest level in Cuba was a .240. He posted strikeout rates around 11 and 12% for the last four seasons he played in Cuba and seems to walk nearly as often or more in some seasons. Overall, Guerrero has a nice skillset that should play well in the MLB. As far as plate discipline goes, in his time in Cuba his numbers in that regard look a lot like the numbers that Alexei Ramirez put up at similar ages, and Ramirez has gone on to post excellent strikeout rates in his time in the show, though his walk rate cut approximately in half. Ramirez may be a good comp for plate discipline, but the overall profile just doesn’t line up. Ramirez was a burner on the basepaths where Guerrero has been a hideously ineffective base stealer (2 steals in 10 attempts at the highest level) and Guerrero figures to put up the kind of power numbers that Ramirez can only fluke into (cough*2008*cough) year-in-year-out. A comp I like a bit more is framing Guerrero as a Chase Utley type hitter, albeit probably without the plus-plus defense and above-average baserunning. He should hit for the kind of power that Utley has through his career, and could likely see the same kind of see-saw batting average that Utley has as well given that his high-contact approach will make him more susceptible to BABIP fluctuations. Overall, Dodgers’ fans should have faith in their front office and scouting departments as they have paid dividends for them in the past calendar year. Hopefully they are able to ride the wave of excellent evaluation that they’ve been practicing thus far and Alexander Guerrero justifies their faith in him and their decision to let Ellis hit free agency, count me amongst those positive about his abilities, and put me down for a projected .260/.320/.475 line in 2014, which most teams would love to see from the tip of the diamond. Summary: Powerful Cuban defector should be rare slugging second-baseman, with a hit-tool that may not be too far behind. Bodes Well: No one doubts the power – a rare commodity at the keystone, and aggressive Cuban hitters have shown an ability to hit big-league pitching in spite of concerns. Portends Doom: A 20% SB success rate is disgusting, words like ‘rigid’ and ‘stiff’ most often used to describe his defense (albeit at SS), hasn’t played professionally in over a year. Posted on November 23, 2013, in Dodgers, Hitters, International Signings, Profile, Promotions and tagged Alexander Guerrero, Alexei Ramirez, Chase Utley, Hanley Ramirez, Mark Ellis, Yasiel Puig, Yoenis Cesepedes. Bookmark the permalink. Leave a comment.